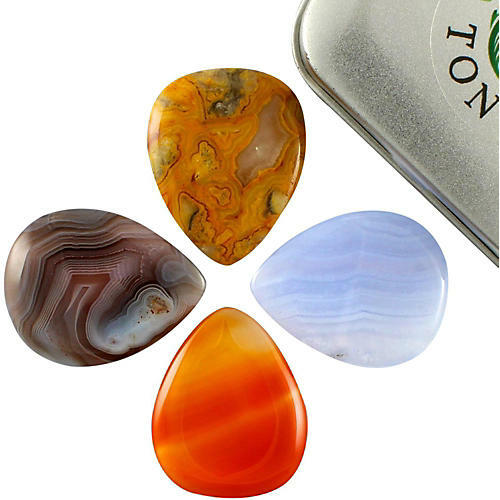 Includes one of each of Timber Tones' Agate Tones picks: Blue Lace Agate, Botswana Agate, Crazy Lace Agate, and Carnelian Agate. Packaged in a metal carrying tin. All of their mineral picks have been designed thick and easy to grip with a chamfer that leads down to a theyll-defined playing tip. The tip itself has a relatively large radius in both axis to offset the brittle nature of materials with this level of density.